All pet parents want the best for their dogs. Stewart Fiber Formula Dog Biscuits were developed by a veterinarian for dogs with special dietary needs. These treats provide supplemental fiber with lasting health benefits. We gently process the all-natural ingredients in Fiber Formula dog treats. 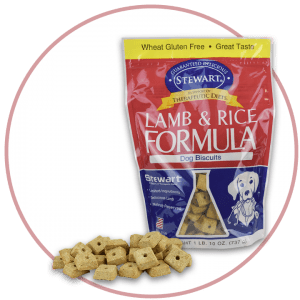 Stewart Fiber Formula Dog Biscuits are a crunchy treat that’s low in sodium. Fiber Formula Dog Biscuits were specifically developed for dogs with special needs and restricted diets. Healthy dogs love them too! They are a smart choice to maintain the health of your beloved pet. Plus they are only 24.7 Kcals per treat making them an acceptable treat for dogs on a restricted diet when used in moderation. We fortify Fiber Formula dog biscuits with essential vitamins and minerals including taurine, for healthy heart function and strong eyesight. Your veterinarian can recommend feeding guidelines based on your dog’s overall health, fitness and dietary needs. Each biscuit measures 2 in. long, 1 in. wide, 1/4 in thick. Ask your veterinarian for the correct feeding level based on your dog’s condition and activity level. Adjust caloric intake based on dog’s age, exercise level and health.